S500 reverse osmosis system uses the most advanced water treatment technology available. Reverse Osmosis is recognized as one of the best available technologies for producing high quality drinking water. It's also the same method used by many bottled water companies to make safe and great tasting drinking water. The newly designed S series S500 is user friendly with design simplicity in mind. It requires no tools for filter changes. Use twist and quick-change cartridge design makes filter changes fast, clean and easy. The stainless steel tanks is durable and will not rust or dent. This space saving allows maximum use of your under counter space. The stylish design of the PurePro S500 system was created to fit elegantly in any kitchen environment. 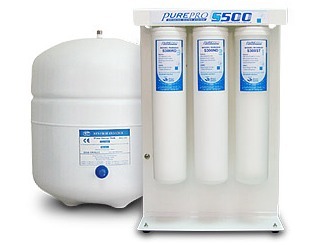 The economical, friendly, easy-to-install and easy-to-maintain solution to your purified water needs. Use quick-fitting connector design makes installation fast and easy. Replacing the filters on this system is one of the easiest to do. Quick-Change Filter Cartridges make cartridge replacement fast, clean & easy, without contact with used filter material . No Mess, No Fuss with these filters just remove the old ones and install the new filters. European design golden type faucet. A thin film composite (TFC) high quality membrane that processes 80 gallons per day. It remove the following hard water contaminants that may be present in your water: lead, cooper, barium, chromium, mercury, sodium, cadmium, fluoride, nitrite, nitrate, and selenium.